The greatest English Romantic novel was written in a year without a summer. Mount Tambora in Indonesia had erupted in April of 1815, and a year later the northern hemisphere was afflicted with climate anomalies best summarised by one Massachusetts woman who noted: ‘Weather backward.’ Frost and snow came in June, and in that ‘wet, ungenial summer’ of ‘incessant rainfall’, an 18-year-old Mary Wollstonecraft Shelley, then still a Godwin, eloped to Switzerland with her future husband, the poet Percy Bysshe Shelley. 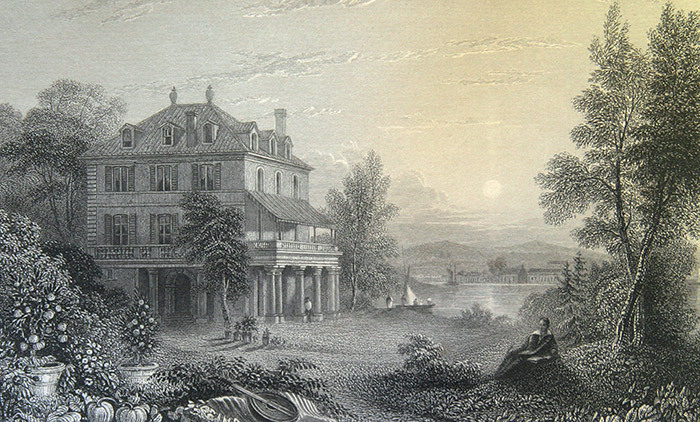 They stayed near Villa Diodati overlooking Lake Geneva, which was rented by the poet Lord Byron (whom one mistress had judged ‘mad, bad, and dangerous to know’) and the writer John William Polidori. Later that year, the Shelleys would be married, and she’d start on her novel, printed two years later in 500 copies and titled Frankenstein; or, the Modern Prometheus. Inspired by what the poet Samuel Taylor Coleridge declared was ‘end-of-the-world Weather’, the group decided one night to entertain themselves with ghost stories. Shelley wrote that initially she could grasp only a ‘dull Nothing’ as her compatriots mined folklore. During those cold summer nights, they had many conversations to which Shelley was, by her description, ‘a devout but nearly silent listener’. The men, perhaps with performative swagger, discussed ‘various philosophical doctrines’, including ‘the nature of the principle of life, and whether there was any probability of its ever being discovered and communicated’. On the docket were the experiments of Erasmus Darwin, the supposed reanimation of life by Luigi Galvani, and more ancient, occult forms of knowledge. From that vision, Shelley would ultimately stitch together and animate Frankenstein. The book is often interpreted as an allegory about the dangers of unfettered science and technology. Margaret Atwood notes that: ‘Once upon a time there weren’t any scientists, as such, in plays or fictions, because there wasn’t any science as such, or not science as we know it today.’ In place of computers, there were scrying mirrors; rather than centrifuges, there were alchemical glasses; no robots but homunculi. These ‘alchemists and Faustian magicians certainly form part of the mad scientist’s ancestral lineage’, but Shelley introduced something entirely new. By stripping Frankenstein of magic, demons and incantations, and giving over her narrative to biology rather than theurgy, she birthed the mad scientist. The scholar James Rieger, however, disagreed with this view, arguing in 1974 that the novel presents a ‘switched-on magic, souped-up alchemy, the electrification of Agrippa and Paracelsus’ rather than science fiction. Even as readers were attracted to Galvani with his twitching frogs’ legs, early modern science was still mostly a sober affair, defined more by the Royal Society than by insane genius. That the book is so often described as the first science-fiction novel doesn’t mean that concern with science is necessarily at its core. Frankenstein itself evidences that the novel is ‘about’ something else, even as it’s been long interpreted as concerned with science. Victor Frankenstein writes that he wished to ‘procure the whole works of [the medieval alchemist Cornelius Agrippa] and afterwards of Paracelsus and Albertus Magnus’, two similarly occult writers. The doctor explains that he ‘read and studied the wild fancies of these writers with delight; they appeared to me treasures known to few besides myself’, acknowledging this, though magic had been eclipsed, and that his fellow students are ignorant of those worthies. Shelley depicts the establishment’s dismissal of such archaism, with one professor telling Frankenstein that: ‘You have burdened your memory with exploded systems and useless names.’ Such was the view later expressed by Shelley’s father, the notorious William Godwin, who in his Lives of the Necromancers (1834) described alchemy as the ‘wildest extravagances of human fancy, the most deplorable perversion of human faculties, and the most horrible distortions of jurisprudence’, even while acknowledging that parsing the strange glyphs and calculations of an occultist such as John Dee or Simon Forman might ‘occasionally afford us a salutary lesson’. Frankenstein later embraces (unclear) scientific methods, but the aura of the sacred permeates his experimentations. He exclaims that he had a ‘contempt for the uses of modern natural philosophy’. He felt that it was ‘very different, when the masters of science sought immortality and power’. Those desires were ‘grand’, while Frankenstein bemoans that ‘now the scene was changed’. Far from being simply ignorant of science, Shelley rejects totalising dogmas of positivism, so that, as the science writer Philip Ball notes in Unnatural (2012), it is only ‘on the surface’ that Frankenstein is ‘wholly secular’. Ball writes that the novel’s ‘insight owes more to theological than to scientific tradition’ and that Frankenstein ‘expresses ambivalence towards procreation itself’. Meanwhile, Shelley reflects on the conception of that monster, writing that ‘frightful would be the effect of any human endeavour to mock the stupendous mechanism of the Creator of the world’, later describing the title character as a fellow ‘artist’, and the monster as his ‘odious handiwork’, thus belying an interpretive truth. Frankenstein is about the writing of Frankenstein. The true monster is the novel itself. The philosopher George Steiner wrote that the ‘beginning of the story is also the story of the beginning’ and, as related to Frankenstein, it’s helpful to return to the time when Shelley had that initial vision. The critic Peter Conrad explains that the ‘artist’s brain, as Mary Shelley saw it, resembles that gulf of unebbing where the elements were mixed before cosmic order pacified them: “dark, shapeless substances” murkily boiled and bubbled’, and where eventually her ‘creations [were] as brain-children’. 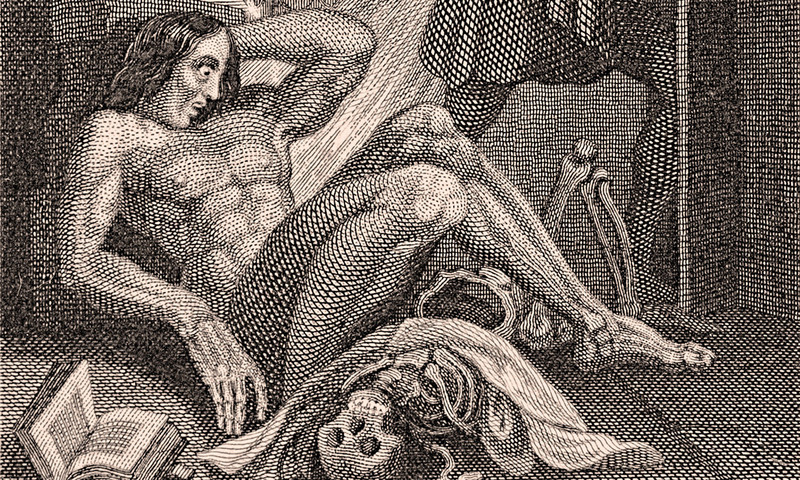 Frankenstein imbued cadaverous legs and arms with life; Shelley’s bodily appendages are of a textual variety. She claims that the novel is about how the ‘parts of a creature might be manufactured, brought together, and imbued with a vital warmth’ – an apt description of her creative process as well. When Frankenstein describes the ‘astonishment which I had at first experienced on this discovery … so great and overwhelming that all the steps by which I had been progressively led to it were obliterated’, we understand that Shelley is describing the writing of the novel itself. Shelley’s aesthetic theory was a variation on the Faust legend, but there inspiration comes from demons. Frankenstein’s monster is rather born from our minds – a shift in understanding creation. Still mysterious, inspiration is now germinated within. But while such a view of ‘genius’ had precedents, Shelley appropriates warnings about necromancy from archaic myths. Hers is an atheistic legend, albeit one still enchanted with a dark sense of the sacred. Now the dangers of creation are the awesome power of the individual – a warning about the Enlightenment’s rational men and Romanticism’s heroes, fully interrogating its own ideology. Conrad explains that this is the modern myth of ‘genius whose rebellion drives the world we still live in … an artist who unleashes the incubi inside his head’. From the Dr Moreau of H G Wells to Stanley Kubrick’s Dr Strangelove, the frantic cackle of the mad scientist has frizzled like sparking electrodes. Yet Frankenstein is fundamentally not about the dangers of science, but of art; it’s not a warning about discovery, but about creation. It is our modern world’s most sacred of texts, in which God’s once-thundering declarations are mute, replaced with the shriek of the monster himself, screaming: ‘Accursed creator!’, only now across the once-cold Arctic tundra, into years without winters.